George Ward Tjungurrayi was born near the site of Lararra, southeast of Kiwirrkura circa 1945. 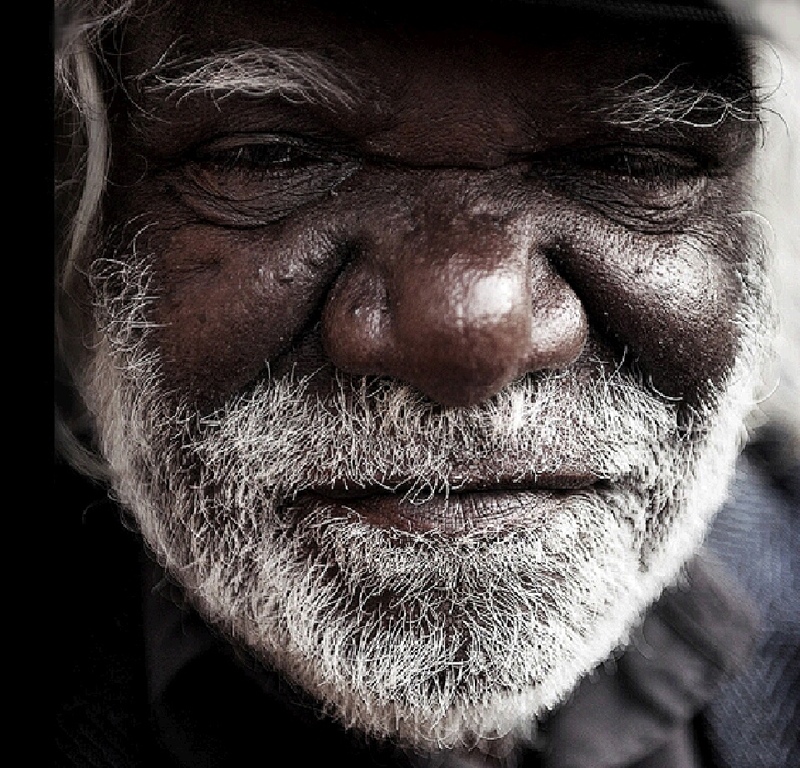 George Ward is the youngest of three brothers; the late Yala Yala Gibbs (founding member of the Papunya art movement and senior custodian of secret/sacred men business) and Willy Tjungurrayi (one of the most sought after painters of the Western Desert). They were all sons of Pulpalpulpalnga Tjapaltjarri but had different mothers. George's father died while he was still very young. It was only in his teenage years that he first encountered Europeans, when Jeremy Long's Welfare Branch patrol came upon his family camped by a desert waterhole. After travelling to the government settlement at Papunya - first home of the desert painting movement - Ward worked briefly as a fencer and a butcher in the community kitchen. He also met and married his wife, the somewhat formidable Nangawarra Ward Napurrula (the daughter of Charlie Ward Tjakamarra), a member of one of the desert's most dominant families. They have two children. Once their first child was born, the couple moved west to Warburton, then on through the ranges to Docker River and to Warakurna. In 1981 George and his family moved to the newly established Pintupi capital of Walungurru (Kintore) which is across the NT border, in the looming shadow of Mount Leisler, where they still spend time today. George observed the work of his brothers Yala Yala and Willy Tjungurrayi, who were among Papunya's Tula's leading artists in Walungurru. In 1984 George Ward first painted on canvas: a handful of elegantly "classical" concentric roundel works from that time survive. After the death of his brother, Yala Yala in 1998, the responsibility to paint fell squarely on Ward's shoulders. By this stage, he was a senior desert man: He lived deep in the world of law. He began to paint in earnest, developing his own distinct style. The canvases he began producing for Alice Springs-based Papunya Tula artists were like nothing else that had come before in the desert art movement: sombre, cerebral, full of grave intellect. The big lake site of Kaakuratintja (Lake Macdonald), which a large group of Tingari men travelled through on their way east, is often the subject of his paintings. His meticulous geometric drawing is often offset by more rapid, shaking dotting to produce a shimmering surface. In 2004 George won the prestigious 2004 Wynne Prize at the Art Gallery of New South Wales. George has also exhibited in many galleries throughout the past decade. George Ward is a reticent and silent Western Desert man. These character traits can cause the odd practical problem, now that he has become one of the nation's most admired and most keenly collected artists. He's not at home in English; sees no merit in photographs; is uneasy in big, bustling towns like Alice Springs. "I'm a bush man, me," he insists, with a distinct, proud edge in his voice. in photographs; is uneasy in big, bustling towns like Alice Springs. "I'm a bush man, me," he insists, with a distinct, proud edge in his voice. formidable Nangawarra, a member of one of the desert's most dominant families. where they still spend time today. sombre, cerebral, full of grave intellect. process can be protracted. The work still bears no resemblance to its final form. days of meticulous detailing, the shimmer of the finished surface begins to show. sense of how space is enlivened by spirit. canvases, both by him and by his immediate family. doing; he has something to say about what he sees, and feels, and knows." respond to the power, the purity and the intent." The NGV's Ryan also sees a continuing tradition beneath Ward's novel surface. design, and in its lack of figuration and restricted palette." shirt and close-fitting trousers, summons his dog-pack, and walks away. Behind him is his painted mirror of the desert: it lies gleaming on the dusty ground.